Our world is full of good and bad things. It depends on us that what we follow. If we follow good, we get good and if we follow bad, bad we get. There are always these two sides you always find and you have to choose one yourself what you want. Every corner, every side of this world is full with these two sides and you can find it in every field. When there was a starting of this world there was nothing, only except some people who did not know how they would survive on this earth but time gets going and they learned with this passing time many things and developed for themselves too. They learned to plough the land, learned to seed it and they knew that if anything one wants to get then one has to struggle for it. With eating and graining food things they invented many other things for their entertainment and for getting rid of their boredness . At that time there were no cinema and movie things like, so for their entertainment they had competitions, competitions for physical strength. They invented many sports for measuring one’s physical strength and one of them was wrestling. It was the sport that was liked and loved by everyone at that time and it is still being loved and liked around the world. Wrestling develops according and with time having its many styles, forms and techniques and now it is competed in Olympic Games. There are many sportsmen from around the world come to take part in it and I am one of them who recently participated in this hustle bustle sport wrestling in my country and local competitions. I take part from Suffolk County wrestling club. It is the most admired wrestling club in New York where many wrestling competitions are held and many participants from nearby Counties take part in it. You can check its schedules and other updates that what is going to happen there.Wrestling is one of my favorite sports from the other strength and muscle sports. When I was a small kid I saw people doing swimming, playing Tennis, Football and other sports and I thought about them how much power and strength they have to spend on playing these sports and doing this they become strong but how much. My fondness was always towards a sport that could give me ultimate power, confidence and a real feeling of winning something winnable and I found my fondness in wrestling. I admire other sports and games too but I admire wrestling most. In coming time I am going to take part in wrestling County Nassau where many other Counties’ wrestling winners are coming to participate. It is going to be a huge thing where many people are coming to see us. It is all New York wrestling. I suggest all young people for coming to see this club competition. It will teach you many things about wrestling because you can learn by seeing and the best with your eyes you see the best you learn. It is wrestling in long island. So it is all wrestling time in New York or you can say it is going to be New York wrestling. So I will suggest everyone to come and witness this amazing, strengthful sport wrestling. You can be super strong learning this . Time is running with its fast speed and with this time everything is running fast leaving behind things and people who could not run with this fast time. Today everywhere you see development in technology, infrastructure, facilities, and services and in other areas too, with this development the standard of people’s living is also developing but with this, one thing is also developing and increasing and that thing is crime. You see that that time has gone when people came to help others and there were not robberies, loot and other criminal activities as today are, not to a higher extent that in nowadays’ world prevails. The crime is rapidly increasing and there are multiple facets of it and because of this crime and criminals some innocent people are become prey to it but you know or ever you think that what is the reason behind it that people very easily come into these criminals’ hand? Perhaps the reason is; that you are weak or not that much physically strong to fight them or save yourselves. You have to be strong to save yourselves from these people because for your safety you could not depend on others. So now the question comes how to build yourselves? There are many forms and fighting methods that can help you to build and develop yourselves. You should keep in mind that you learn these methods only for your safety, not to harm others. One of the best of them is wrestling. It is an old sport from ancient times and also effective to make you strong and fit, for it you can join any wrestling club and get trained there by a qualified coach. 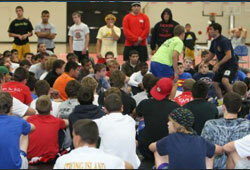 You can also join a summer wrestling camp near your town if it is arranged or can go to other town to join it. There are many camps arranged during summer time and done by a qualified coach and one thing you should also keep in mind that whenever you join you always train under a qualified coach. There are many styles and forms of wrestling popular and one of them is freestyle wrestling. 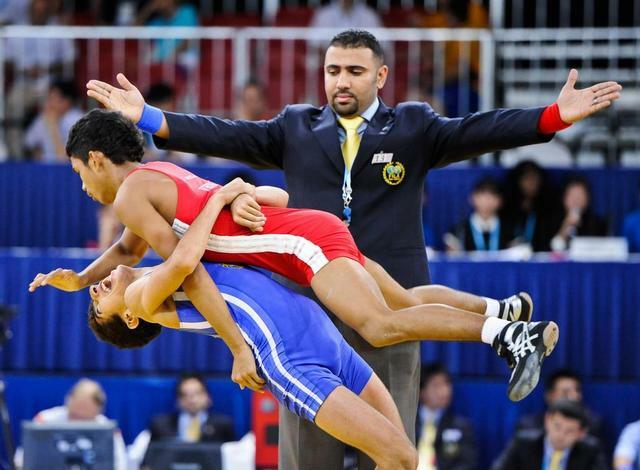 It is a type of amateur wrestling that is practiced around the world and also contested in Olympic Games. In this type of wrestling one has to throw and pin down an opponent to a mat, which is its main ultimate goal. It is a complete style of stand-up wrestling which brings traditional wrestling and Judo and Sambo techniques too. You can get training in it by joining summer camp in long island which is soon going to be arranged where coach like Vougar and other will come to teach you. So join this summer camp and do wrestling in long island and save yourself and others and make yourself fit and strong to fight anything. On the other hand physical activity like this one also develops self confidence and more than that learning it you have the chance to enter into Olympic Games and perhaps may win a gold medal. On the whole wrestling has many benefits.